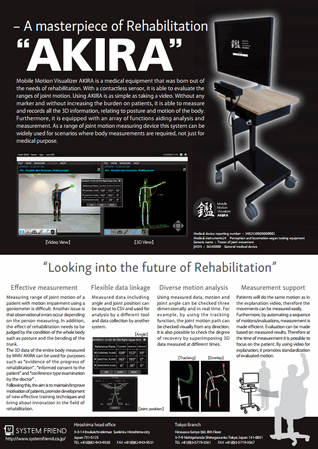 Mobile Motion Visualizer AKIRA | 株式会社システムフレンド | SYSTEM FRIEND INC.
A masterpiece of Rehabilitation "AKIRA"
Mobile Motion Visualizer AKIRA is a medical equipment that was born out of the needs of rehabilitation. With a contactless sensor, it is able to evaluate the ranges of joint motion. Using AKIRA is as simple as taking a video. Without any marker and without increasing the burden on patients, it is abl e to measure and records all the 3D information, relating to posture and motion of the body. Furthermore, it is equipped with an array of functions aiding analysis and measurement. As a range of joint motion measuring device this system can be widely used for scenarios where body measurements are required, not just for medical purpose. "Journal of Medical Engineering & Technology"